The centre pivot pine ventilated window is the available in numerous sizes this centre pivot window is the perfect daylight solution with the added benefit of a simple click open and shut trickle vent positioned at the top of the frame, once opened the inset mesh will allow fresh, clean air into the room while the window may remain safely and securely shut. 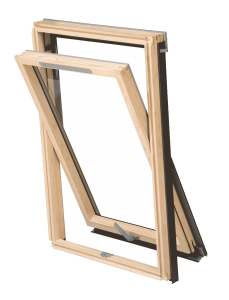 With Sleek Scandinavian pine frames it allows maximum daylight and like other Duratech windows the DVX sits recessed into the roof giving a smoother, flush effect. Trickle vents can be clicked open or left shut with just a simple push and click.